Download "WARWICK. 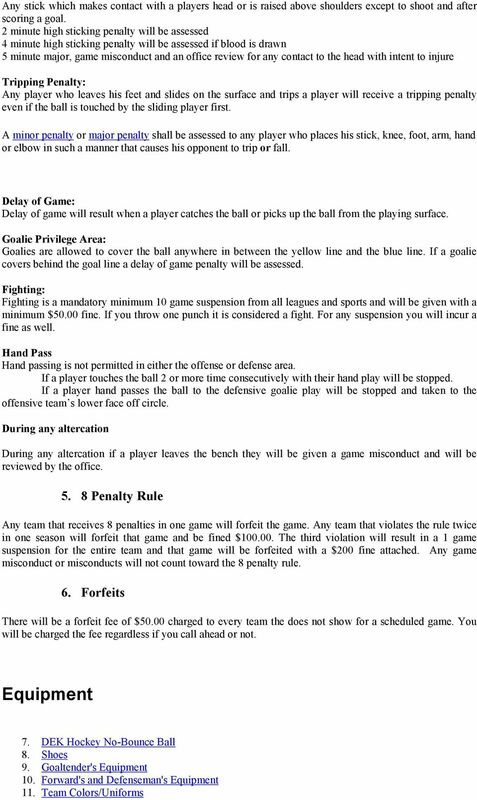 Official DEK Hockey Rules"
5 12. Dangerous Equipment 7. DEK Hockey No-Bounce Ball a. The colors range from various shades for warm or cold weather temperatures. The referees decide which color ball will be used by dropping them from a height of 3 feet onto the playing surface. The ball when dropped from a height of 3 feet will not rebound more than 8 inches on the first bounce and no more than 2 inches on the second bounce. The ball with the least amount of bounce determines which ball will be used. If the bounce is the same the referees shall decide which ball will be used. Once the game is underway the color or type ball may be changed. 8. 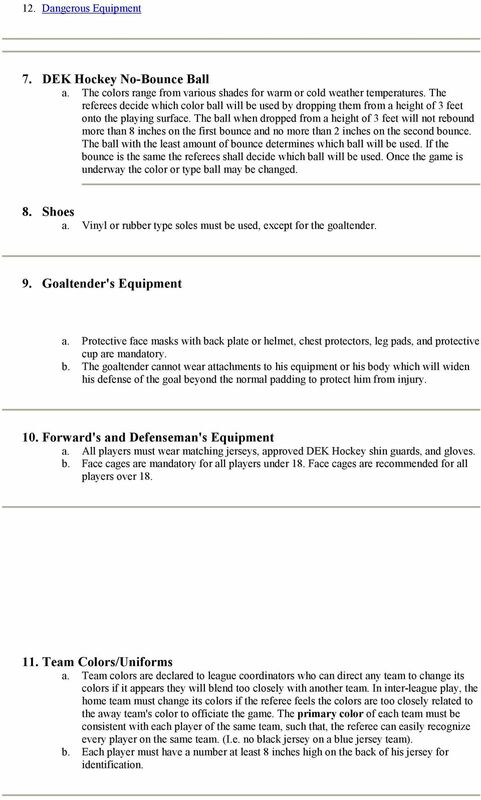 Shoes a. Vinyl or rubber type soles must be used, except for the goaltender. 9. Goaltender's Equipment a. Protective face masks with back plate or helmet, chest protectors, leg pads, and protective cup are mandatory. b. The goaltender cannot wear attachments to his equipment or his body which will widen his defense of the goal beyond the normal padding to protect him from injury. 10. Forward's and Defenseman's Equipment a. All players must wear matching jerseys, approved DEK Hockey shin guards, and gloves. b. Face cages are mandatory for all players under 18. Face cages are recommended for all players over Team Colors/Uniforms a. Team colors are declared to league coordinators who can direct any team to change its colors if it appears they will blend too closely with another team. In inter-league play, the home team must change its colors if the referee feels the colors are too closely related to the away team's color to officiate the game. The primary color of each team must be consistent with each player of the same team, such that, the referee can easily recognize every player on the same team. (I.e. no black jersey on a blue jersey team). b. Each player must have a number at least 8 inches high on the back of his jersey for identification. 7 a. The referee may stop play at any time whenever, in his opinion, a player or goaltender may have been injured and continuance of play could make the injury more serious. Generally the referee will allow play to continue and wait until the team suffering the injury has possession of the ball before halting play. If the injury was caused by an opposing player while committing an infraction, the referee will stop play when the opposing team has control of the play. b. A penalized player who has been injured may be exempt from going to the penalty box providing a substitute goes to the box for him. Violation is a bench minor penalty. c. If a goaltender is injured, no more than 2 minutes is allowed for him to recuperate and return to the goal. 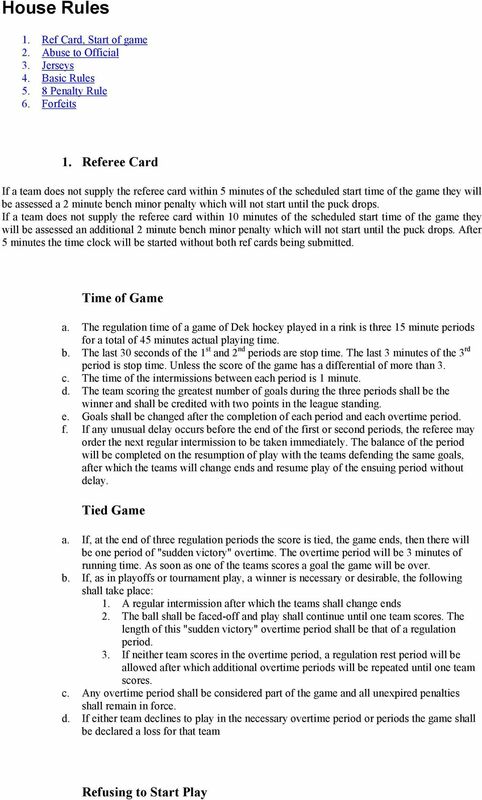 If he is unable to return, he must be either replaced, within 5 minutes including equipment change, or the team plays without a goaltender and the team is allowed 6 players on the playing surface. 17. Appointment of Officials 18. Referees 19. Goal Disputes and Scoring Credit 20. Abuse or Threats to Officials 21. Scorer - Timekeeper 17. Appointment of Officials a. All officials including scorers-timekeepers are appointed by the GM and league manager. 18. Referees a. Two referees are required to officiate a game. They have full control of the game in calling offsides, clearing infractions and assessing penalties. Each referee patrols one half of the rink which will be designated between them before the start. Both referees have equal powers to make calls in both zones. Should there be a difference of opinion by the referees on a call or a goal, the final ruling rests with the referee in whose zone the infraction or goal occurred. The referee also notifies the scorer-timekeeper as to who scored the goal and who assisted, if any. b. Each referee shall check the nets in his zone for any damages prior to the game. The referee calls the teams to the playing surface at the start of each game and each period. Before starting the game, the referee sees to it all other officials, including the scorertimekeeper, are in their respective positions. 19. Goal Disputes and Scoring Credit a. The final decision, in the matter of disputed goals, is given by the referee. He also notifies the scorer-timekeeper as to who scored the goal and the assists, if any. No more than two assists may be given on any goal. 20. Abuse or Threats to Officials a. Any player, coach or manager, who is discourteous or threatens a referee or other official before, during, or after a game, or the entire season, must be reported to the league manager for immediate disciplinary action and possible suspension. b. Any player, coach or manager who intentionally strikes a referee, or other official during or after a game receives a match penalty and is reported to the league manager and GM immediately following the game. 12 taking the penalty shot providing that player was on the playing surface when the call was made. 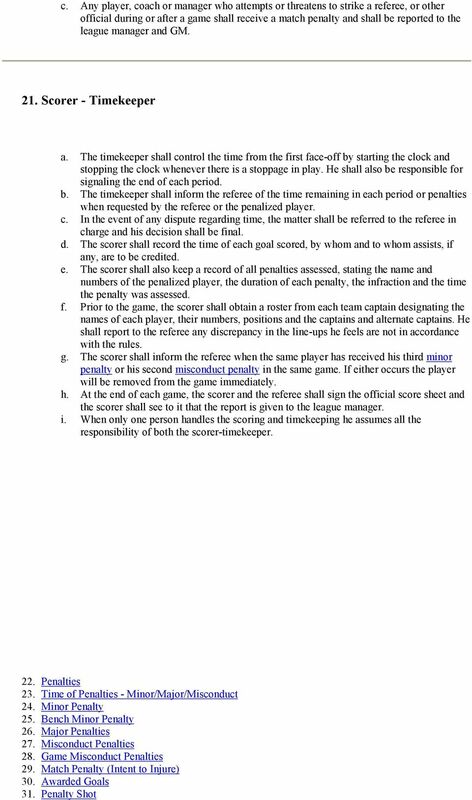 d. If the penalty shot was awarded for falling on the ball or picking up the ball with his hand while the ball is in the goal crease, the captain will designate which player, who was on the playing surface at the time of the infraction, will take the penalty shot. e. While the penalty shot is being taken, players of both sides shall withdraw to the sides of the rink and beyond the blue center line. 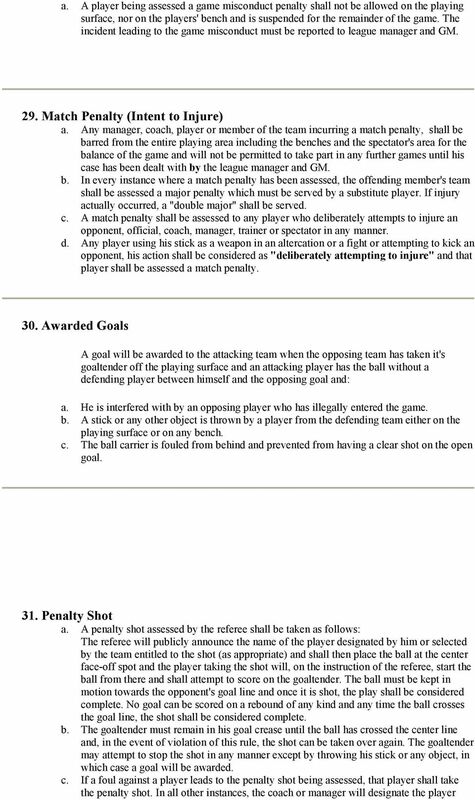 No member of an opposing team may interfere in any way with the player making the penalty shot. f. If a goal is scored from a penalty shot, the ball is faced-off at the center spot. If a goal is not scored, the ball is faced-off at either of the two end face-off spots where the penalty shot was tried. 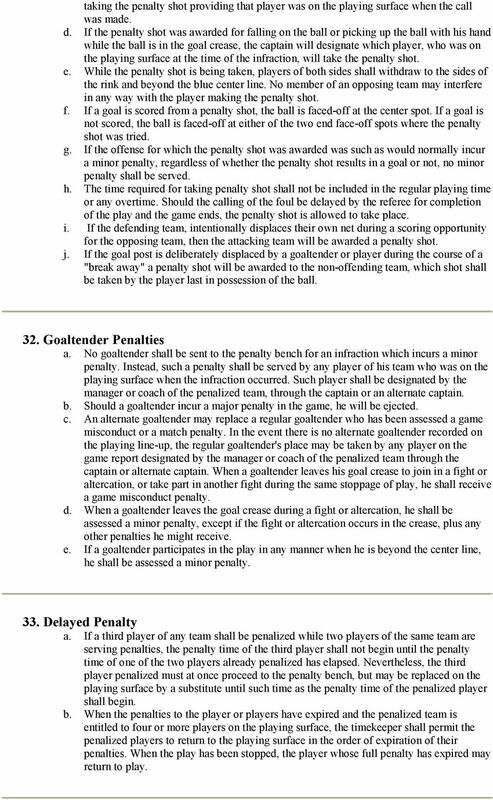 g. If the offense for which the penalty shot was awarded was such as would normally incur a minor penalty, regardless of whether the penalty shot results in a goal or not, no minor penalty shall be served. 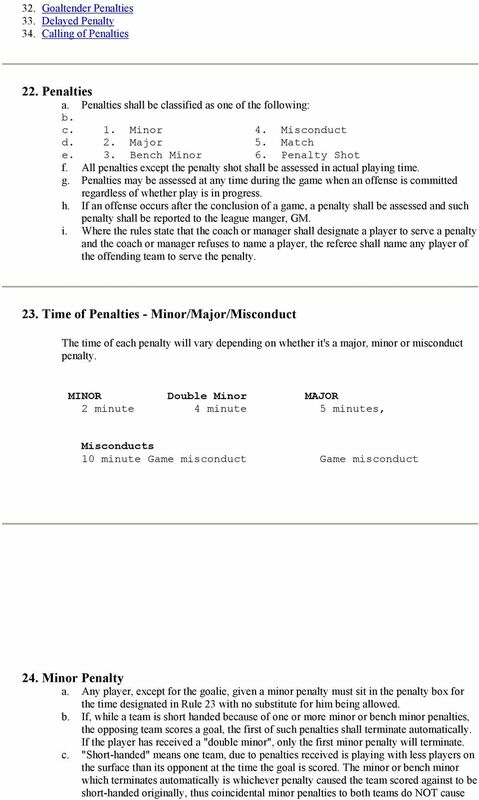 h. The time required for taking penalty shot shall not be included in the regular playing time or any overtime. Should the calling of the foul be delayed by the referee for completion of the play and the game ends, the penalty shot is allowed to take place. i. If the defending team, intentionally displaces their own net during a scoring opportunity for the opposing team, then the attacking team will be awarded a penalty shot. j. 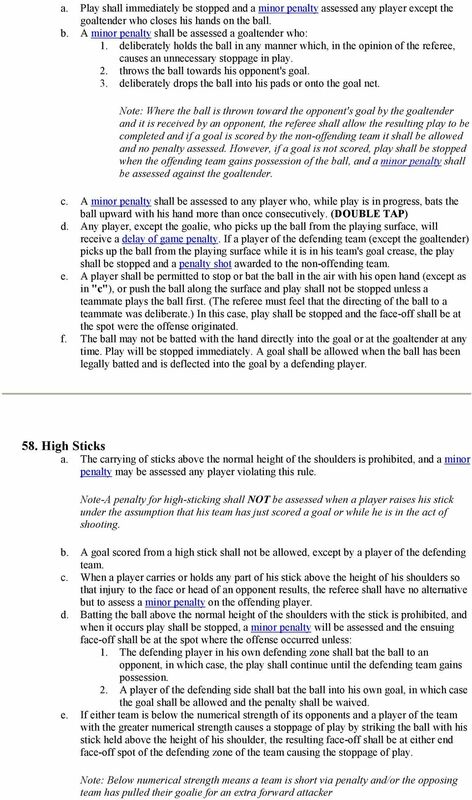 If the goal post is deliberately displaced by a goaltender or player during the course of a "break away" a penalty shot will be awarded to the non-offending team, which shot shall be taken by the player last in possession of the ball. 32. Goaltender Penalties a. No goaltender shall be sent to the penalty bench for an infraction which incurs a minor penalty. Instead, such a penalty shall be served by any player of his team who was on the playing surface when the infraction occurred. Such player shall be designated by the manager or coach of the penalized team, through the captain or an alternate captain. b. Should a goaltender incur a major penalty in the game, he will be ejected. c. An alternate goaltender may replace a regular goaltender who has been assessed a game misconduct or a match penalty. 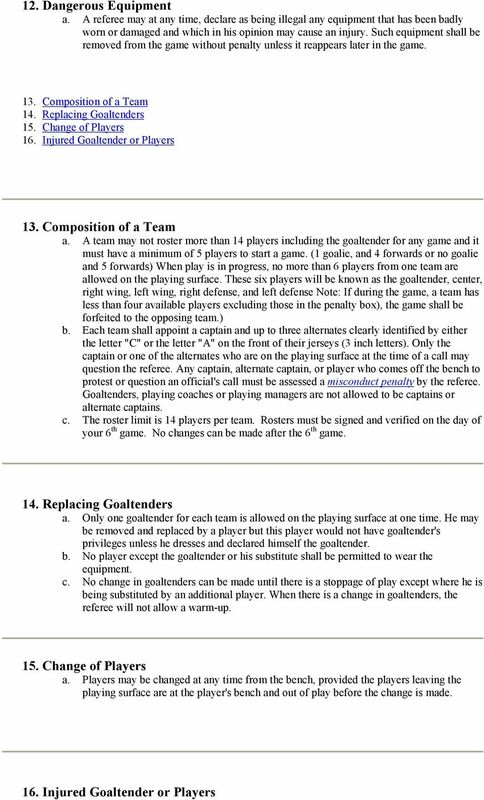 In the event there is no alternate goaltender recorded on the playing line-up, the regular goaltender's place may be taken by any player on the game report designated by the manager or coach of the penalized team through the captain or alternate captain. When a goaltender leaves his goal crease to join in a fight or altercation, or take part in another fight during the same stoppage of play, he shall receive a game misconduct penalty. d. When a goaltender leaves the goal crease during a fight or altercation, he shall be assessed a minor penalty, except if the fight or altercation occurs in the crease, plus any other penalties he might receive. e. If a goaltender participates in the play in any manner when he is beyond the center line, he shall be assessed a minor penalty. 33. Delayed Penalty a. If a third player of any team shall be penalized while two players of the same team are serving penalties, the penalty time of the third player shall not begin until the penalty time of one of the two players already penalized has elapsed. Nevertheless, the third player penalized must at once proceed to the penalty bench, but may be replaced on the playing surface by a substitute until such time as the penalty time of the penalized player shall begin. b. When the penalties to the player or players have expired and the penalized team is entitled to four or more players on the playing surface, the timekeeper shall permit the penalized players to return to the playing surface in the order of expiration of their penalties. When the play has been stopped, the player whose full penalty has expired may return to play. 16 The manager and coach shall be responsible for the conduct of their players at all times. They must try to prevent disorderly conduct before, during, or after the game, on or off the playing surface and any place in the rink or business places or places of lodging. The referee may assess penalties on any of the above officials for failure to do so and shall report full details of any incident to the league manger and GM. a. A misconduct penalty shall be assessed on any player who: 1. Uses obscene, profane or abusive language or gestures to any person. 2. Persists in disputing or shows disrespect for the ruling of any official. 3. Intentionally knocks or shoots the ball out of reach of an official who is retrieving it. 4. Any player who intentionally breaks his stick inside the immediate playing area. A player who, after receiving a misconduct penalty, persists in using obscene or profane language shall be assessed a game misconduct penalty and ordered to the dressing room. In such cases, a substitute shall be allowed. b. A manager, coach or trainer guilty of such misconduct shall be removed from the bench and ordered to the dressing room for the remainder of the game by the referee through the captain or alternate captain. The referee shall report the incident in full detail to the League manger and GM, who may assess suspension penalties. c. If the referee is unable to identify the person responsible for the use of obscene, profane or abusive language, a bench minor penalty shall be assessed the offending team. 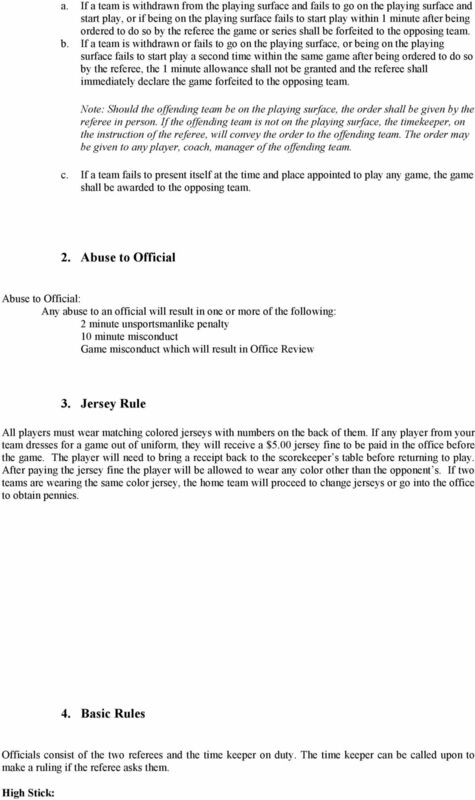 d. A minor penalty for unsportsmanlike conduct will be assessed any player: 1. 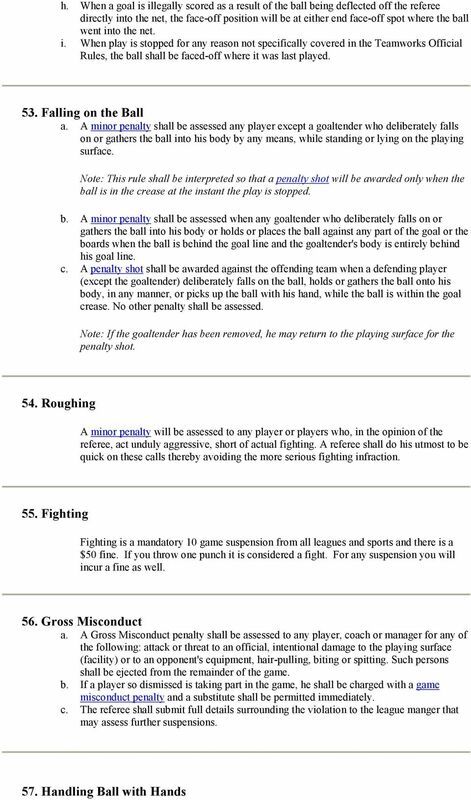 Using obscene, profane or abusive language on the rink that was not directed at a specific person (See also Rule 45a(l). 2. Showing disrespect towards any referee or game official in any degree less than what would incur a misconduct penalty. e. A misconduct penalty shall be assessed any player who, after one warning by the referee, persists in any course of conduct (including threatening and abusive language or gestures or similar actions) designed to incite an opponent into incurring a penalty. f. A misconduct penalty shall be assessed any player or players who, except for taking their positions on the penalty bench, enter or remain in the referee's crease while the referee is reporting to or consulting with any game official including the timekeeper or official scorer. g. A bench minor penalty shall be assessed against the offending team if any player, manager, coach or trainer throws anything on the playing surface. 43. Adjustment of Equipment a. 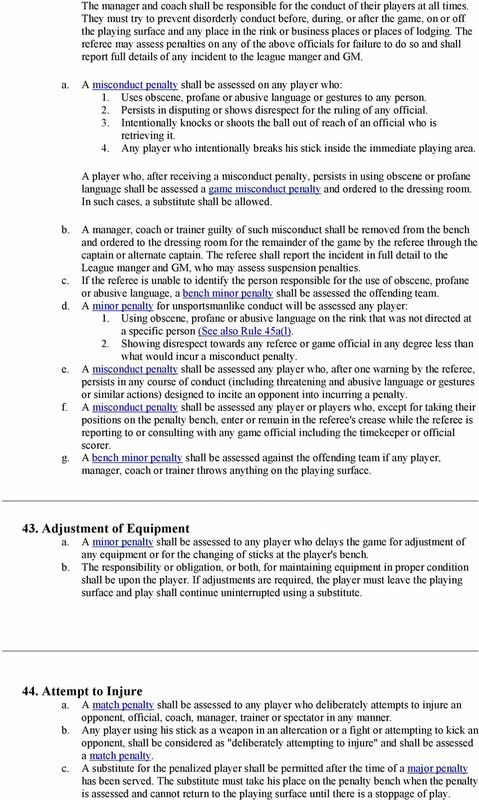 A minor penalty shall be assessed to any player who delays the game for adjustment of any equipment or for the changing of sticks at the player's bench. b. The responsibility or obligation, or both, for maintaining equipment in proper condition shall be upon the player. If adjustments are required, the player must leave the playing surface and play shall continue uninterrupted using a substitute. 44. Attempt to Injure a. A match penalty shall be assessed to any player who deliberately attempts to injure an opponent, official, coach, manager, trainer or spectator in any manner. b. 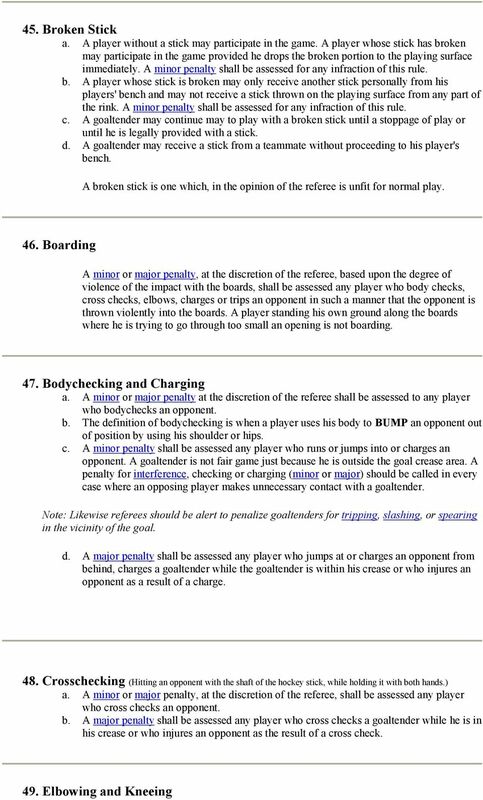 Any player using his stick as a weapon in an altercation or a fight or attempting to kick an opponent, shall be considered as "deliberately attempting to injure" and shall be assessed a match penalty. 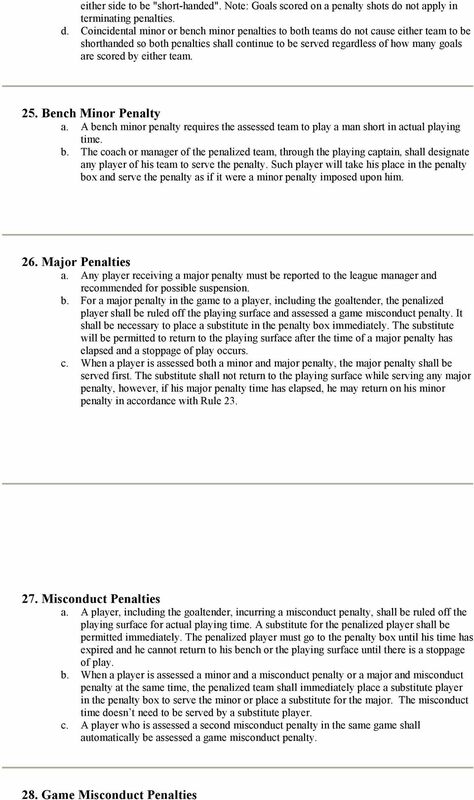 c. A substitute for the penalized player shall be permitted after the time of a major penalty has been served. The substitute must take his place on the penalty bench when the penalty is assessed and cannot return to the playing surface until there is a stoppage of play. 18 a. A minor penalty shall be assessed any player who fouls an opponent in any manner with his elbow or knee. b. A major penalty shall be assessed any player who injures an opponent by elbowing or kneeing. 50. Deliberate Injury a. A match penalty shall be assessed any player who deliberately injures or kicks an opponent, official, manager, coach, trainer or spectator in any manner. b. It shall be necessary to place a substitute on the penalty bench when the penalty is assessed to take the place of the penalized player and the substitute player shall not return to the playing surface until a double major has been served. 51. Stepping on the Ball Any player except the goaltender who intentionally steps on the ball and holds it under his foot for more than 2 seconds shall be given a minor penalty for delay of game. 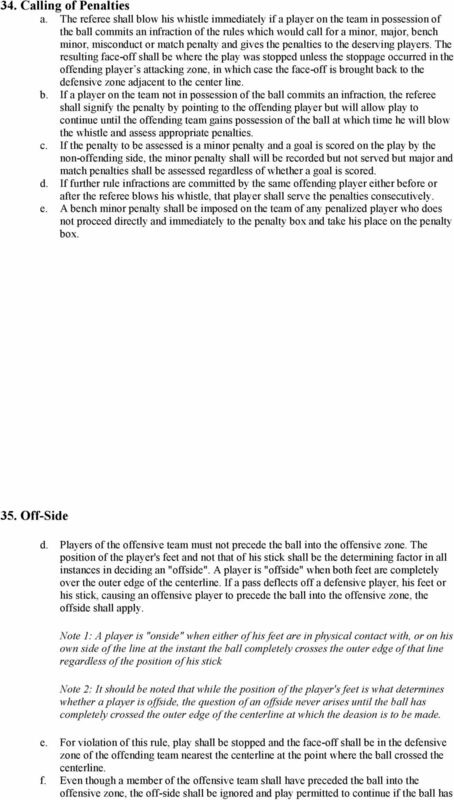 This rule does not apply when two opposing players are "digging" for possession in the corners or along the boards. 52. Face-offs a. A face-off shall take place by the referee dropping the ball between the sticks of the players facing-off. The ball must hit the surface before either player makes contact with the ball. Neither player may contact his opponent's body in any way until the face-off is completed. The players taking the face-off shall stand squarely facing their opponents end of the rink approximately one stick length apart with the full blade of their sticks flat on the playing surface and entirely clear of the place where the ball is to be dropped. All other players on both teams must be at least 12 feet away from the player taking the faceoff and they must be on-side. If a violation of this rule occurs, the referee shall order another face-off. Note: If, after a warning by the referee either of the players fails to take his proper position for the face-off promptly, the official shall be entitled to face-off the ball even though only one player is in position. b. 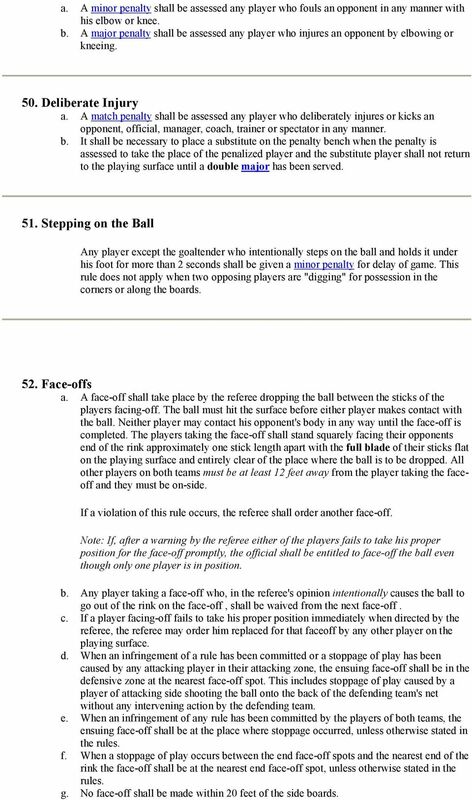 Any player taking a face-off who, in the referee's opinion intentionally causes the ball to go out of the rink on the face-off, shall be waived from the next face-off. c. If a player facing-off fails to take his proper position immediately when directed by the referee, the referee may order him replaced for that faceoff by any other player on the playing surface. d. When an infringement of a rule has been committed or a stoppage of play has been caused by any attacking player in their attacking zone, the ensuing face-off shall be in the defensive zone at the nearest face-off spot. 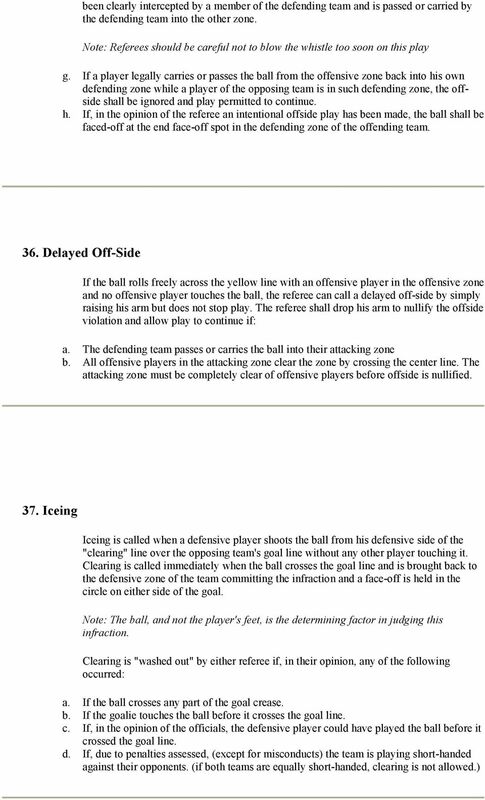 This includes stoppage of play caused by a player of attacking side shooting the ball onto the back of the defending team's net without any intervening action by the defending team. 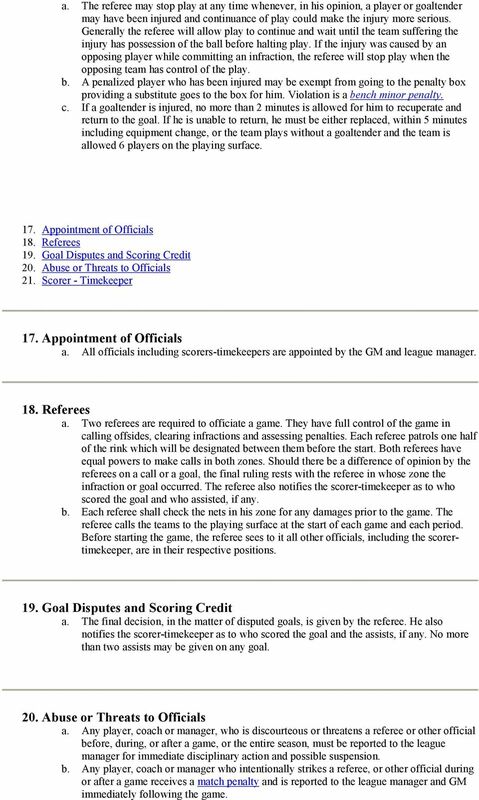 e. When an infringement of any rule has been committed by the players of both teams, the ensuing face-off shall be at the place where stoppage occurred, unless otherwise stated in the rules. 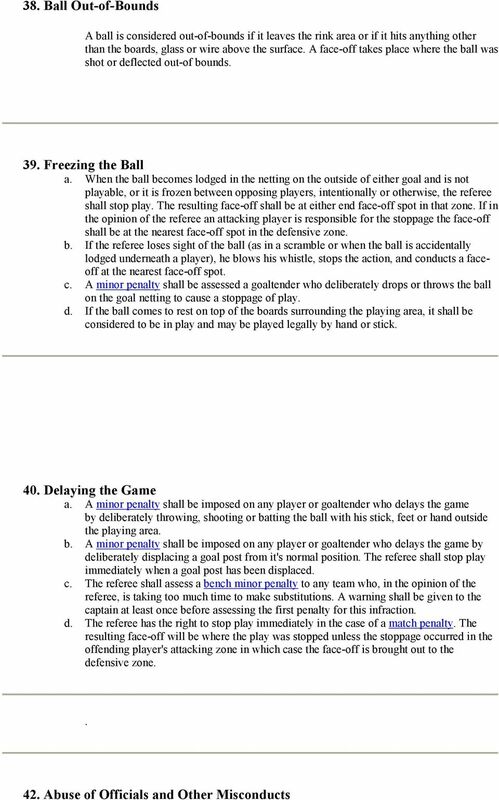 f. When a stoppage of play occurs between the end face-off spots and the nearest end of the rink the face-off shall be at the nearest end face-off spot, unless otherwise stated in the rules. g. No face-off shall be made within 20 feet of the side boards. Answers and commentary There will be at least 3 quizzes this season. To work state playoffs you must complete one of the three. Submit your answers via survey monkey. There is no specified passing grade. DAVIESS COUNTY GIRLS SOFTBALL ASSOCIATION GOVERNING RULES ARTICLE I NAME This organization shall be known as Daviess County Girls Softball Association. ARTICLE II Section 1. PURPOSE General Purpose A.
Dodgeball Team Registration Form October 27, 2012 @ 7 p.m. @ West Harrison Community School Team Members 1.) 2.) 3.) 4.) 5.) 6. MANDATORY RULES MEETING 9:00 AM.